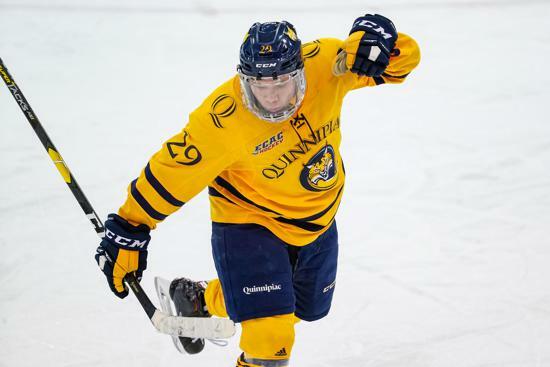 Do you know the highest-scoring Minnesotan in men’s college hockey? He doesn’t play for the Gophers, Huskies or Bulldogs. Not for North Dakota, Denver or Wisconsin. 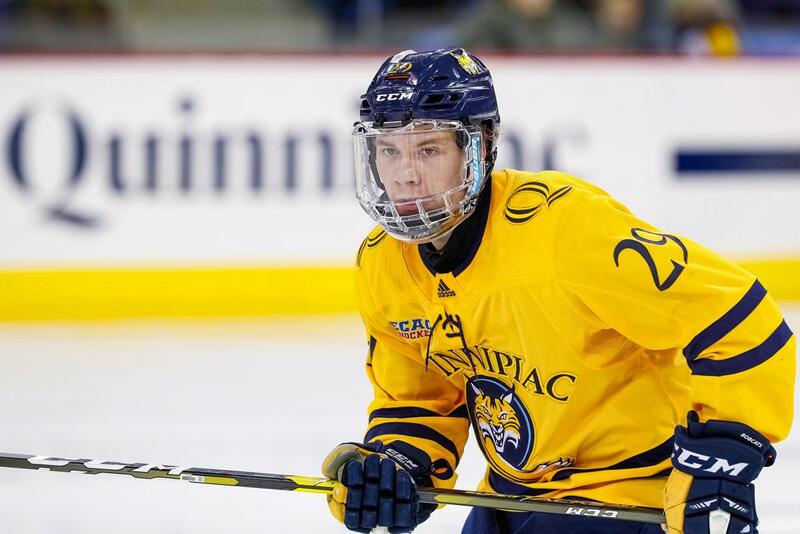 His name is Odeen Tufto, a Chaska native and forward for the top-10 ranked Quinnipiac Bobcats of Hamden, Conn.
Of the 10 Mr. Hockey finalists in 2015, Tufto was the only player who had not committed to play college hockey, despite tallying an eye-popping 81 points in 31 games at St. Thomas Academy. In fact, he only had one offer upon finishing high school. The Chaska Chanhassen Youth Hockey product spoke with MHJ about patience, skill development, goal-scoring and how size is no longer a factor at the highest levels of hockey. MHJ: Do you remember when you first tried skating or got into hockey? Odeen Tufto: My older brother, Andy, played. He got me into it. I started on figure skates because my older sister, Allie, was a figure skater. One of the biggest things, when I went to watch my older brother’s games, I loved to watch the Zamboni. That was kind of my thing. I don’t really know why, but whenever intermission or the end of the game came, and the Zamboni came out, I was obsessed. MHJ: You were the only uncommitted Mr. Hockey finalist. Why? Tufto: I didn’t have much at the end of my senior year, even though I had a very good year statistics-wise and team-wise. I was told that I needed to prove myself because of my size and weight. MHJ: You certainly proved it in junior hockey. Tufto: Yeah, I had about 25 colleges talk to me after I had a strong showing at the BCHL showcase. Denver, Notre Dame, Boston College, Bemidji State, Quinnipiac and others were showing a lot of interest. MHJ: It seems like kids—and parents—want to commit earlier and earlier. Was it hard to wait? Tufto: I’ve never been a big fan of kids committing so young. I was telling a high school player recently, ‘Hey, I only had one offer coming out of high school. And at that same time, ninth-graders were committing to the University of Minnesota.’ You can’t worry about what other people are doing. MHJ: Any advice for other kids who may be smaller in stature? Tufto: You don’t want to get discouraged. Focus on yourself and understand you have your strengths and weaknesses. The game is trending more on speed and skill. Size just isn’t as huge of a thing now, which is great for small guys. Small guys are tearing up the NHL right now. You can see that on TV every night. Don’t worry if colleges aren’t looking at you. If you know you’re a good player, stay the course and keep working. MHJ: How do you work on hockey sense and skills? Tufto: At a young age on our backyard rink, my dad always emphasized how important it was to keep your head up and have that vision and use your peripheral vision. Try creative plays that a normal person wouldn’t do on the ice. That’s been drilled into my mind. The creativity factor: If you’re able to have it and use it with confidence, it can go a long way. And then on top of that, you always have to work on your skills, and work on your weaknesses, too. MHJ: You had a backyard rink? Tufto: We had one for probably 17 years. I credit a lot of my success to that. Growing up in Minnesota, I would be out there a lot. My dad would set up some obstacles for me to shoot, pass and stickhandle around. And just playing with buddies out there and playing 3-on-3 hockey. I grew up with guys like Shane Gersich and Mikey Reilly who are in the NHL. I was a younger guy in their eyes but they’d always invite me out and let me play. At the time I don’t think they realized just how big of an eye-opener it was for me because they were older guys and they were just so much better. I just became a sponge to them and learned from them. MHJ: Do you think more kids should be playing outside? Tufto: Absolutely—100 percent. It’s pond hockey. It’s fun. You just go out there and use your speed and your skills and it will ultimately make you a better hockey player. MHJ: What are you working on now? Tufto: Last year I didn’t do a great job in the goal column. Shooting has been a big thing. Strength and technique, but also the ability to think the game at a higher level and one step ahead. I’ve been really trying to keep my eyes up. Look at the net and look where I’m shooting and practicing different ways of scoring. It’s not just shooting. Maybe it’s tipping or rebounds or just having a knack for finding pucks in front of the net, wraparounds, being in tight and getting the puck up. You have to find different ways to score. MHJ: How do you like it out east? Tufto: I grew up my whole life in Minnesota, so to experience a new part of the country is pretty cool. We play all the Ivy League and ECAC teams and Hockey East. Our biggest rival is Yale and our series is called the Battle of Whitney Avenue. We’re all up and down the east coast. It’s a little different part of the world when you come from the Midwest, culture-wise. It’s been really fun for me. 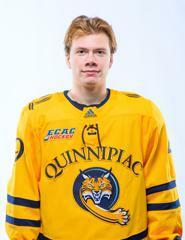 Fun Fact: Tufto was the highest-scoring freshman in all of college hockey in 2017-18, posting 9 goals and 32 assists for 41 points in 38 games.